The memorial of St. Francis serves to teach us as much about a way of life as it does about a person. St. Francis is the icon of giving oneself to God; he is the teacher par excellence in the way of abandoning one’s soul and body into the hands of God. In order to apprehend spiritual abandonment we must first seek to know God in ways that we may be unaccustomed to thinking about. St. Francis teaches us the lesson of seeing God in the least of our fellows; we learn through his example the path of recognizing God in places where we ordinarily might not think to seek. We may turn to the scripture today in order to clearly see the might, power and accessibility of God. Truly, it would be difficult to express the being of God better than the description that Job gives us of the awe of the Almighty. As I read through the first reading I recalled the words of the Shema Yisrael, “Hear O Israel the Lord our God is one.” The Lord is singular, that is, without comparison. To comprehend God, just to begin comprehending, we must know God as God. We must come to the realization that our words can never capture or encapsulate God but that we may come to know God by giving ourselves entirely to the other, that is, by giving to that which we do not identify as part of ourselves or our self-interests. In coming to know God we imitate the action of Christ, which is kenosis—the pouring out of self. I have intuited for many years now that kenosis, rather than being an arbitrary self-denial is an intended giving of oneself to an intended recipient. In the self-emptying of Christ the recipient is all of creation: God transforms creation through Christ's gift of himself. St. Francis, by seeking to imitate the self-emptying of Christ, symbolizes self-giving to those whom the Spirit directs us in love. It is the greater love to give of oneself completely wherever a need exists. Thus, Franciscan spirituality imitates the kenosis of Christ. St. Francis' gift of self stands for peace in the world today. Perhaps above all other things in the world we need a way that we can look to as the example of giving ourselves in order to make peace. Making peace is something that requires us to become acquainted with all upon which our Lord in his glory poured out himself to redeem. We are to aim toward harmony with all of creation, for creation yet awaits us and calls to us to heal where there is still that which remains broken and separated. True self-giving love, love that does not consider itself but always considers the other first, is the love that will change the world. 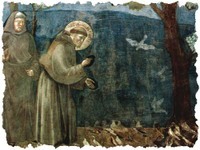 The true spirituality of St. Francis for us to follow today is the love inherent in the action of friendship. I know of no greater love—and to me it stands as a mighty witness to God’s presence among us—than the love in friendship. I suppose the ultimate way of knowing God as God is to begin knowing God as one’s friend. However, before we can know God as a friend in love, we have to learn what it means to be a friend in love. Well, I must agree. But that learning hurts worse than an appendectomy, from what the newly appendix-less tell me. A beautiful reflection. We're grateful. Yes, kenosis goes well beyond any arbitrary acts of self-denial, doesn't it? It is on a higher level, a higher plane; it is a way of being, and ultimately, this self-emptying includes and surpasses any and all individual acts of self-denial possible. Kenosis, as a way of living, becomes one's discipline of denial. Basil Pennington said that Thomas Merton had an "ascesis of generosity", and I think what he meant was, Merton lived a life of kenosis. Merton managed never to shut anyone out. Even now, folks walk right into his wide-open monastic arms to celebrate Christ with him. Is that what "ascesis of generosity" means?